🍗Thanksgiving is coming!!! We’ll be sharing Tips and Tricks to make the biggest meal of the year more manageable! That way, when the day comes, you actually have ⏰ time to spend with friends and family! Join the Once A Month Meals team as we share our best tips and tricks for making the biggest meal of the year more manageable! Thanksgiving is only a week away are we are already planning our menus and printing of our grocery lists! If you’re like us and hosting, that can mean a lot of preparation! Join our team members, Ricki and Kelcey, as they walk you through some of our favorite recipes to try, as well as tips for making and freezing your favorite holiday dishes ahead of time! 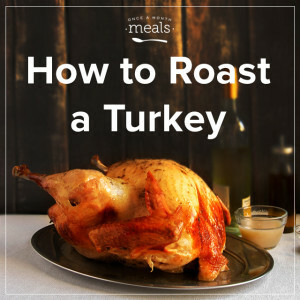 Whether this is your first time to roast a turkey for the holidays or you practically dream of rubs and basting these quick and easy steps will help ensure your end result is golden perfection.